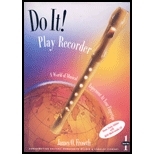 This spectacular method by three of the best educators in the field today contains everything you need to teach and play the recorder. Song repertoire includes music of various styles, time periods, and countries. The book includes a music dictionary. The individualized format lets students progress at their own pace. Optional CD covers all the basics. Teacher's Resource Edition has extended accompaniments, extensive cross-referencing indeses, and resources for teaching to the National Standards for Music.